PA Chairman Mahmoud Abbas will demand the release of 123 prisoners before agreeing to meet PM Binyamin Netanyahu, says PLO negotiator. Palestinian Authority Chairman Mahmoud Abbas will demand the release of 123 long-term prisoners before agreeing to meet Prime Minister Binyamin Netanyahu, PLO negotiator Saeb Erekat said on Friday. Speaking to the Bethlehem-based Ma’an news agency, Erekat said Abbas wants Israel to free 123 prisoners detained before the signing of the Oslo Accords in 1993. 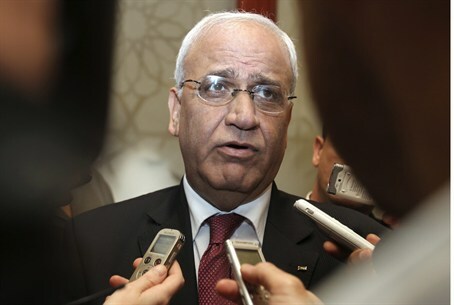 Erekat also said Abbas may meet with Israel's deputy prime minister Shaul Mofaz, but noted that no date has been set for such a meeting. Mofaz on Thursday called on Abbas to take advantage of the large coalition and begin peace negotiations. Abbas has continued to demand that Israel accept the indefensible pre-1967 lines as final borders, release all Arab terrorists from its jails, and halt construction in Judea, Samaria and east Jerusalem for a second time before talks begin. Last week he warned that he may seek non-member status for a Palestinian state at the United Nations if peace talks with Israel do not resume. Mofaz indicated last week that he means to meet with Abbas in order to get the peace process going, which is one of the four major issues to be addressed as part of the recent coalition agreement between Likud and Kadima. Meanwhile, Fatah official Nabil Shaath said the PA did not have faith in the Israeli government to follow through with its declarations. Yasser Abed Rabbo, secretary-general of Fatah's executive council, said on Thursday that PA officials were wary of maintaining the status-quo with Israel at the expense of progress. “What we're afraid of is that this process exists to contain any crisis that may occur and not to push the political process forward,” Abed Rabbo told Voice of Palestine radio.